Our stop in the N’gorongoro Crater was our last in this year’s trip to Tanzania, so we chose to splurge on our accommodation for our two nights in the Crater. All of the lodging options are on the Crater’s rim, and the high elevations make sleeping in a tent a cold and damp affair. With memories of a less-than-desirable camping experience in 2006, we booked a room at the N’gorongoro Wildlife Lodge. It was a very nice place with a delicious buffet for breakfast and dinner, well-appointed rooms and an incredible view of the crater below. It also included a few bonus wildlife sightings. Upon our arrival at the hotel, we were greeted by two spotted hyenas just outside the gate, and our departure the following morning was delayed by a small herd of buffalo crossing the road as we headed out for our game drive. The biggest surprise, though, came when we spied an elephant feeding on the bushes right outside the picture window of our room! Almost everything at the lodge seemed decadent after nearly a fortnight of camping (heat, electricity, mattresses, hot showers, cold beer! ), but hands down the best service provided by the hotel was the dedusting of everything in our safari vehicle—including us—upon our arrival after the long drive from the Serengeti. When Mansour dropped us off, the bellhops quickly unloaded our gear. All of our belongings were coated in a thick layer of white dust, and the hotel staff started whacking everything down with towels. Large plumes of dust wafted into the air around us, and it was hard not to feel a little bit like the Pigpen character from Charlie Brown. One of the front desk clerks even told Mansour that he looked like a mzungu since he was covered in so much dust! We were spared the whack treatment and given refreshingly cold facecloths to wipe the dust off on the outside and a cold juice to wash the dust down on the inside. In a matter of minutes, we were declared dust-free and allowed to check in. We wished that we could have stopped laughing long enough to pull out the videocamera or snap a few photos because it was a really amusing scene! After a shower and a good night’s sleep, we were eager to head out on safari again the following morning. The sheer density of animals in the N’gorongoro Crater is greater than anywhere else in Tanzania, so we had high hopes for great animal encounters and fantastic photo opportunities. Almost immediately after the dramatic 900 meter descent into the crater, we were greeted by enormous herds of wildebeests and zebras grazing on the dry grasses of the crater floor. Flocks of fluorescent pink flamingos patrolled the shallow waters of the large alkaline lake while impressive formations of grey-crowned cranes cut through the sky on their way to greener grasses on the far side of the crater. We had great sightings of a jackal, a very tolerant Kori bustard, a spotted hyena coated in mud, as well as numerous other birds. We managed to position ourselves on the road right at the converging point of two large herds of wildebeest on the move, and it was interesting to observe their loud “haw” greetings as the two groups merged into one. Our time in the crater, however, was dominated by lions. We saw them sleeping, mating, and on the move. We even witnessed a curious female who seemed to be enjoying a safari of her own. She sat all alone, relaxing on the shore of a lake while watching a group of hippos frolicking in the calm waters below. Eventually, a lone male lion appeared to join her. The two were most likely on a short respite from mating. The most dramatic lion sighting of all came when we encountered a small pride of lionesses feeding on a fresh buffalo kill. Unfortunately for the cats, their hunting prize was lying half-submerged in a small stream. By the time we saw them, the five lionesses had to negotiate the steep banks of the ravine and step into the water to try to claim their spoils. Unfortunately, there was only one opportune spot for eating, and the lioness who was currently claiming the pride of place was reluctant to give it up to her fellow hunting mates. She responded with hisses, snarls and growls whenever any of the other cats tried to make a move on her position. So much for feline hospitality! Word of the incredible scene spread like wildfire from safari driver to safari driver, and all the vehicles in the crater seemed to converge on the lions at the same time. The drivers all jockeyed for position to show their clients what would surely be the day’s highlight, and the behavior of the safari guides wasn’t all that different from that of the defensive cats. Unfortunately, the position of the kill was right next to a challenging 4WD river crossing, and the drivers eventually decided to queue up and take turns having a quick pass at the cats. We eagerly awaited our turn and took as many shots as we could with our allotted time. We wished that we could have stuck around to watch how the lionesses dealt with the submerged buffalo. Did they put their selfishness aside to team up once again and drag the buffalo out of the water? Is a group of lionesses strong enough to do that? Or did they just eat as much as they could before leaving what was too difficult to reach for the group of hyenas that had already began to assemble farther downstream? What would happen if the dominant male of the pride arrived? We’ll never know how it all went down, but we heard that already by the next morning, there was nothing left for anyone to see. We were kicking ourselves for not getting back in line to get a second pass at the cats. A bird in hand is always a good choice when it comes to photographing nature subjects. We’ll have to plan another trip back to Africa to witness the endless parade of wildlife spectacles that we encountered on this year’s trip. Our camping safari was fourteen days in total, and we must have spent over 100 hours on game drives. While this might seem crazy to some, we never tired of the amazing wildlife wonders that we had the privilege to observe and photograph. This year’s trip only left us wanting more and counting the days until we can plan our return trip. The sooner, the better! 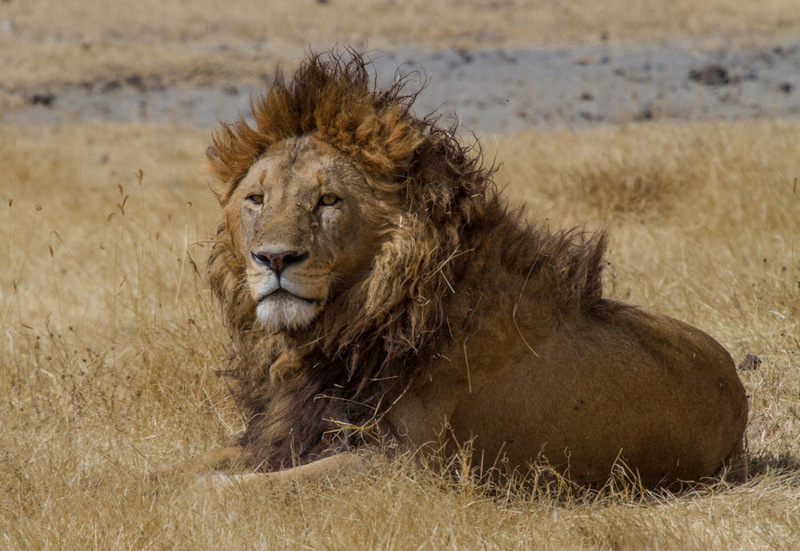 Travel Logistics: Visiting the N’gorongoro Crater is an expensive proposition. As with all Tanzanian parks, there is a park fee for each person that is good for a 24-hour period. In addition, there is a hefty vehicle fee to enter the park, and you must also pay to drive through the conservation area en route to other parks. All these fees make the Crater Tanzania’s most expensive park, and so most people opt to spend only one long day here. We say long because the Crater has one other rule that is unique to the park—once you exit the gate, there is no re-entry, so, like it or not, you are in for a full day’s drive. Of course, when it comes to viewing wildlife, we are a bit more fanatical than most, so we booked two full days in the Crater. In actuality, our second day turned out to be a half day since we had to drive back to the Kilimanjaro Airport for our flight out the following day. We exited the park right after lunch in order to make it to JRO by dark. No matter how many days you spend in the Crater, you will be more likely to get a full day drive if you bookend your visit with accommodation on the Crater’s rim. We wished we had done that and spent the following day driving to the airport. There would have been plenty of time to do so, as our flight home did not leave until late in the afternoon. Some negatives associated with this plan include the stress of making it to the airport on time (the traffic driving through Arusha is horrendous) and catching an international flight after a long dusty drive. Another afternoon in the Crater would have been worth it to us. One thing that surprised us was that breakfast did not begin until 6:30 am, which meant that we couldn’t leave for the crater until 7. It was at least half an hour’s drive along the rim to the park gate and another half an hour down to the crater floor where the true game driving begins. This means the real photography won’t start until after 8, which is rather late by photography standards. We were a bit disappointed by this at first, but we got over it pretty quickly. There was a thick layer of fog at the top of the crater on both mornings, and it took a while for the sun to burn it off. The fog and the high altitude also made for a chilly start, and driving around with the top open for an extra hour or so would have been uncomfortably cold. And, since re-entry into the crater is not allowed, a 7 am start made for a long enough day filled with plenty of photo opportunities. 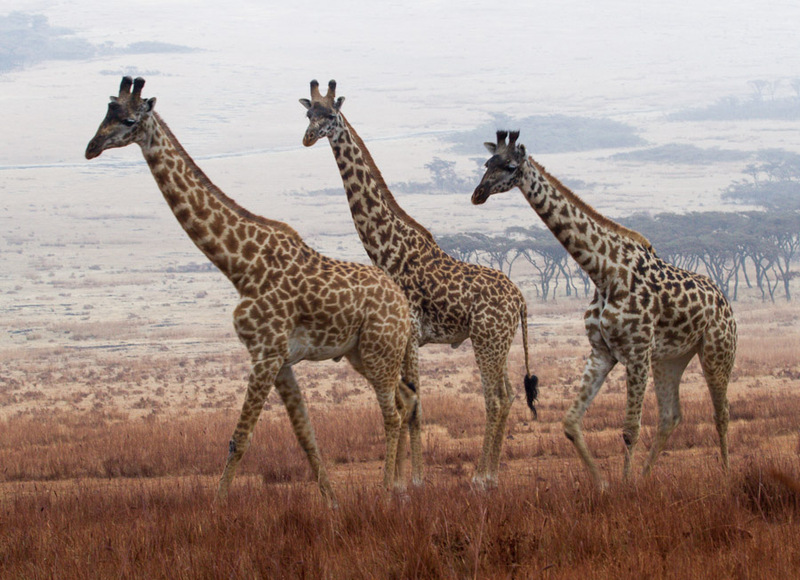 Giraffe can only be seen at the rim of the crater. Many believe this is because they are unable to manage the steep descent into the crater, but it is actually due to the fact that their primary food source, acacia trees, only grow on the crater’s rim. The dense fog behind them is a typical sight on most mornings. One additional note: The night before our flight back to the States, we stayed right next to the Kilimanjaro Airport at the KIA Lodge. Our flight was not until 5:30 in the afternoon, so we had the entire day to hang out at the hotel. At first, we were bummed that we hadn’t stayed in Arusha, as we would have had enough time to explore the town in the morning, but, in the end, the KIA Lodge turned out to be perfect. The cottages of the hotel were spread out over beautifully-landscaped grounds. Between delicious meals at the restaurant, we donned our cameras once again and went on a walking birding safari of our own. It was amazing how many birds were attracted to the plants and water features of the hotel gardens, and we even saw a good number of new species that we had not seen in the previous fourteen days. We were thrilled to get one last bonus safari in before our flight home! Thanks! There’s just something about Africa that can’t be beat. We hope to keep going back for many years to come. Hopefully we’ll feel the same about Ladakh when we meet you two there this summer! Happy New Year! Beautiful pictures! I know nothing about birds but would be inspired to learn about them in a place like this. For about two seconds, I thought the lions looked so snuggly; I changed my mind after seeing the lionesses fighting over a kill! Thanks for sharing such incredible images! P.S. Loved the… er… “unique” rear shot of the zebra ; ) Oh, and the landscape photo of the wildebeest kicking up dust looks so dreamy…beautiful! Thank you so much! We are happy that the information was useful to you. We hope you are able to put it to use soon! Beautiful shots of the lions. Thank you, Ron. That’s high praise coming from a superb photographer like you. Thanks for stopping by! You are so kind. I love lions. Amazing trip and photos! SO jealous!!! We feel very fortunate to have had such great travel experiences. And you have a fair share of your own adventures to make US jealous! Thanks for stopping by. Bellissimo reportage! io ho fatto il safari nello Tsavo east ed è stata una magnifica esperienza. Mille grazie per visitare, Elena. Anche, siamo stati a Tsavo East, ed era magnifica. Que bella vista di Kilimanjaro!